Rock Paper Lizard: Parking lot ornithology. We bought a new car, and decided to take it for a spin. I wanted somewhere scenic. The driver wanted somewhere shopping. So we headed across the border, which could provide both. The driver wanted to go a particular store. I had never heard of it. "You've been there before," she said. I had no recollection, until we got to the parking lot. "Oh," I said. "You should have told me it was the store with the Brewer's Blackbirds in the parking lot." 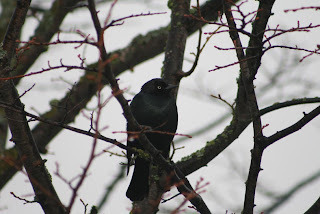 For whatever reason, in that parking lot there are always Brewer's Blackbirds gathered in the spindly trees on the islands, and walking around among the cars. The driver went shopping while I watched and listened to the birds. They are chatty, producing a mixture of "chacks" and squeaky whistles. They're totally charming, natty little things. If you tell the border guards you are visiting America to go shopping, they will let you through without batting an eye. If you tell them you are going there to hang out in a parking lot with Brewer's Blackbirds...well, you'd better just tell them you're going shopping. Hilarious. 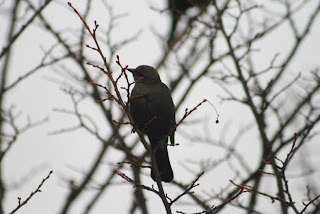 I have been noticing parking lot birds more lately, mostly crows. Also saw some parking lot deer in the Olympics this summer, that was kind of depressing though. Hm, those blackbirds are interesting! Least you had some company whilst waiting lol. Ron Judd, a very fine Seattle Times humourist and a Bellingham resident calls them "Costco birds." He argued in one column that they'd be more suitable than Seattle's "official bird" the Great Blue Heron. Well, actually he misidentified them in the column, but he came clean later. and correctly identified, thanks to hordes of justifiably indignant birders. Fiona, thanks for the links. He's a funny guy. They were in the Bellingham parking lot that Costco shares with other stores.